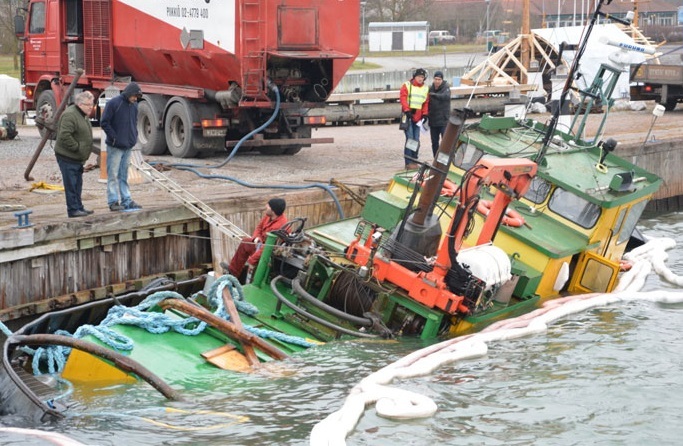 The towing tug Lauri sank at berth in Pargas, Finland. The vessel was docked at the pier, but suffered damages after being battered against berth by wind and waves during the night and started getting water ingress. At the morning the vessel was partially sank, resting the bottom at the pier. The accident was reported to local authorities and the scene was secured by oil booms, as there was oil leak reported from the partially sank tug. At the scene of the pollution site was dispatched hazmat team with water cleansing equipment to remove the spilled oil. The spilled quantity is not sufficient, but on board of the tug there are large quantity of diesel oil at the fuel tanks. Fortunately during the accident there were no injured people and no water pollution. The investigation for the root cause of the accident is under way. Owner is counted for responsible for wreckage removal and covering the cleansing costs to the local authorities. The towing tug Lauri has overall length of 17.00 m, moulded beam of 5.00 m and maximum draft of 2.50 m. The vessel is operating under the flag of Finland.